We love flowers and we love photographing them at our studio, at the venues, in the hands of our clients, and anywhere else we can! Here are a few photos from Andrea and Dennis' book themed wedding at One if By Land restaurant. Beyond the photos, here is a little iPhone video clip that we took at the venue. We had a lovely time working with Bride Amanda on her cool, book-themed wedding vision. The ceremony and reception were held at the One if By Land, Two if By Sea Restaurant in the West Village. Amanda, who is quite the "Renaissance Woman", came up with a great idea for centerpiece accents and a whole general mood for the wedding. She gathered hundreds of books too use as wedding decor. Using lots of the new construction tools that I've accumulated, I drilled holes in some of the books in which I could place the centerpiece vases. Using a 5" diameter core drill, we removed a "core sample" of a book and replaced it with a vase filled with lovely flowers for the wedding day. Flowers, books, silver tones, and lace came together for a lovely complete design at One if By Land. Amanda and Dennis had a wonderful time celebrating with their loving family and dear friends. Their wedding was quintessentially romantic. Photos courtesy of Amanda and Dennis's photographer. 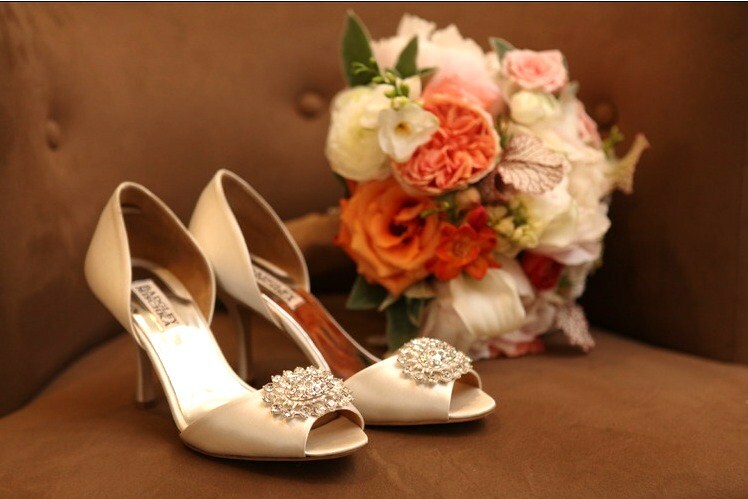 We were so happy to be able to work with the bride and groom, and wish them all the best in their lives together. Working with Kickstarter on their holiday party was a pure blast. We started off by hoisting up large tree limbs and suspending them from the ceiling over the dinner table in the Kickstarter Lower East Side headquarter offices. Each branch was decorated with berries, cones, paper ornaments and clear glass bulbs. In between the wood branches we hung strings of globe lights. The tables were decorated with an eclectic mix of vintage mason jars, gold toned walnuts and berries, magnolia leaves, silver brunia, red berries and red pomegranates. The 80+ foot table was iluminated with lots of candles and draped cafe lights. We also added dozens of candle votives to the long barn wood wall lining the event space. The party was a smash, and we were so happy to be a part of making it feel festive for the holiday season! We recently had the pleasure of creating some exciting arrangements for the Diller-Quaile Music School annual gala at The Harmonie Club in NYC. We chose music as our inspiration, for obvious reasons, and used a lovely spring-time palette accented with gold-toned wire and musical notes. We also created a two-foot tall treble clef using greens and green flowers as a statement piece in the bar area. The arrangements featured a mix of cherry blossoms, quince, hydrangea, dog wood, ranunculus and tulips. The gala was a hit, and we were thrilled with how it all came together. We constructed these floral arrangements for a lovely Valentine's Day dinner party. We went beyond the traditional red roses and included deep burgundy and purple blooms, interesting greenery and vegetables such as artichokes and peppers. A few weeks ago we had a great time working with Anna and Jourdan. The ceremony was held on a rooftop in Park Slope. Afterwards, everyone jumped on the ferry over to the Java Street Pier in Greenpoint. The reception was at Paulie Gee's, a great little Italian restaurant on Greenpoint Avenue Brooklyn. Jourdan and Anna wanted fun and easy flowers that would coordinate with their grey and yellow color palette and bring in an autumnal feeling. 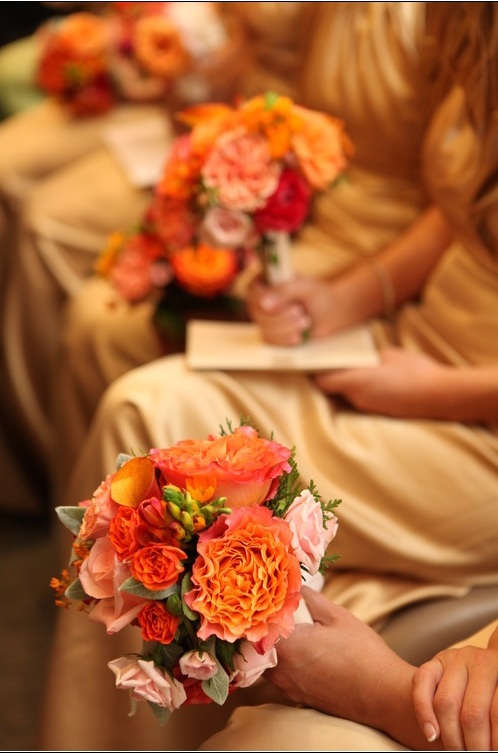 We were able to do this by using ranunculus, billy buttons, garden roses, succulents, dusty miller and kumquats. In addition to flowers, we also provided the wooden stumps and table name cards. Anna and Jourdan named each table after a borough of NYC, which was a very fun idea. We also decorated the tables with pears and crab apples. The wedding cake was made by a family friend, Liz. We helped to assemble and decorate this tasty and cool looking coconut cake. The Brides were also kind enough to send us a little video that a friend of theirs had made, featuring the fun adventures they had on their special day. Thank you! We had a great time working with the ladies and Jourdan's mom Josiane. After some delay, here are some pictures from Katherine and Simon's Maine wedding held at Wolfe Neck Farm, just outside of Freeport Maine. The farm provided the field and Katherine had to work out the rest. We were thrilled that Katherine decided to work with us for her out-of-state big day (especially as it meant that we got to have a Maine lobster roll while we were there)! We were really pleased with how everything came together. Logs, logs, and more logs! We've been busy little bees making all sorts of fun items for Katherine and Simon's wedding. We're cutting different types of birch logs into logs of varying heights which will serve as beautiful table decorations, accented by lots of candles. We're also using birch logs as place card holders and table number cards! It has been a fun and saw-dust filled summer. 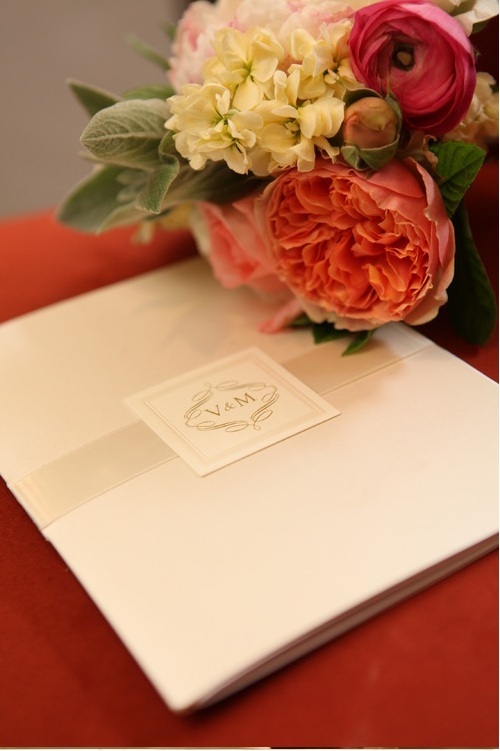 We had a chance to make gorgeous flowers for Vanessa and Martin's May wedding at Columbia University's Faculty House. The Brides bouquet was made up of peonies, garden roses, spray roses, freesia, pitcher plans, calla lilies and accented with lambs ears greenery. Here are a few photos from the professional photographers, The Pros group. The bridesmaid bouquet featured roses, garden roses, spray roses, freesia, stars of bethlehem, calla lilies and ranunculus. We were really excited to make beautiful flower arrangements for Bride Robin for her lovely wedding on a boat here in NYC. The colors were inspired and designed to fit the location with deep red tones. We were able to use greenery from our gardens and the flowers came from the NYC flower market. It was amazing to work at this unique wedding venue!